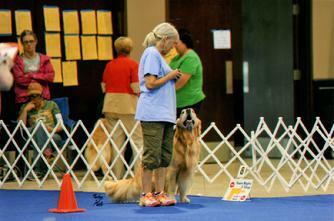 Rally obedience (aka Rally-O) is a canine sport based on obedience skills where the handler and dog navigate a course of 10 - 20 stations that instruct them which exercise to perform. The team moves through the course with the dog under control and on the left side of the handler. Handlers are allowed to encourage their dogs by talking to them. 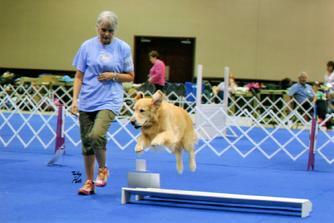 Novice and Intermediate levels are performed with the dog on leash, Advance and Excellent levels are worked off leash. The skills become progressively more difficult as the team advances to the next level. Rally – O is a great way to get an introduction to canine sports and builds teamwork for dogs and handlers to strengthen skills that can be applied to other canine sports such as agility and obedience.